Home» AP GO's | AP LATEST update | AP LATEST UPDATES » AP G.O.NO:132 Women employees Child Care Leave Sanction 2 months Order. AP G.O.NO:132 Women employees Child Care Leave Sanction 2 months Order. AP Tenth Pay Revision Commission on Child Care Leave Sanction of Child Care Leave for two months to the women employees as per G.O.NO:132 , AP G.O.NO:132 sanction of the Child Care leave to all women employees two months of up to 2 years in the entire service career, to look after 2 eldest children up to the age of 18 years , Andhra Pradesh Women employees Child Care Leave Sanction of Leave for two months up to 2 years in the entire service career, to look after 2 eldest children up to the age of 18 years as per G.O.NO:132 , A.P Women employees Child Care Leave Sanction 2 months after 2 eldest children as per G.O.NO:132 , A.P Women employees Child Care Leave Sanction 2 months as per G.O.NO:132. Andhra Pradesh AP Public Services – Finance Department - Recommendations of Tenth Pay Revision Commission on Child Care Leave - Sanction of Child Care Leave for two months to the women employees of the State – Orders –Issued. Representation of the Andhra Pradesh Non-Gazetted Officer’s Association Dated, Nil. Representation of the Andhra Pradesh Secretariat Association dated, Nil. 1.In the references read above, the Associations requested for sanction of the Child Care leave to all women employees. 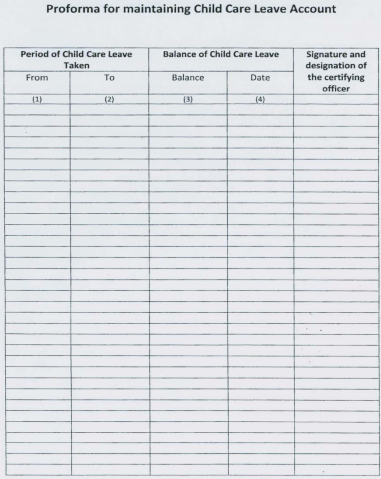 2.The recommendations of the Tenth Pay Revision Commission in this regard are extracted below: The Commission considers the demand to be reasonable and recommends sanction of Child Care Leave of up to 2 years to all women employees in the entire service career, to look after 2 eldest children up to the age of 18 years.